Age related macular degeneration (AMD) is one of the most common causes of poor vision after age 60. Although the specific cause is unknown, AMD seems to be part of aging. While age is the most significant risk factor for developing AMD, heredity, blue eyes, high blood pressure, cardiovascular disease, and smoking have also been identified as risk factors. AMD accounts for 90 percent of new legal blindness in the US. Nine out of 10 people who have AMD have the dry form, which results in thinning of the macula, the area of the retina responsible for central vision. Dry AMD takes many years to develop. Currently there is no treatment. The wet form of AMD occurs much less frequently (one out of 10 people) but is more serious. 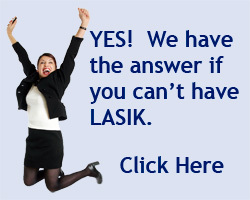 Laser surgery is the only proven effective treatment, to date, for wet AMD. The procedure usually does not improve vision but prevents further loss of vision.